The next release of what appear to be monthly firmware updates for Microsoft's Xbox One console will add a handful of useful options, including real name and external drive support, according to a summary of the changes that Microsoft shared with Kotaku in advance of an official announcement. The real name and external storage options will give the Xbox One its own variation on features offered for the PlayStation 4 and Wii U, respectively. The hard drive option will give users extra storage for saving games, downloadable content expansions and apps. The system will support up to two drives at once, treating them as the default destination for downloaded content. Drives will need to be at least 256GB and support USB 3.0 connections. Games can boot off the drive, and the drives don't need to have their own power supply. Microsoft is suggesting that people take their drives to their friend's house to then use their games there, though they say that doing that will require that the person with the drive either sign into Xbox Live to confirm their ownership of any game they had bought via download or insert a disc to confirm they own the game. If you're comparison-shopping, the Wii U also supports external drives, though Nintendo advises users to use self-powered drives. Sony does not support external storage but uses a standard internal harddrive that users can swap out on their own. Swapping out a drive in the Xbox One voids the system's warranty. Again, by comparison, Wii U does not support real names. The PS4 does, since launch, but handles them differently. 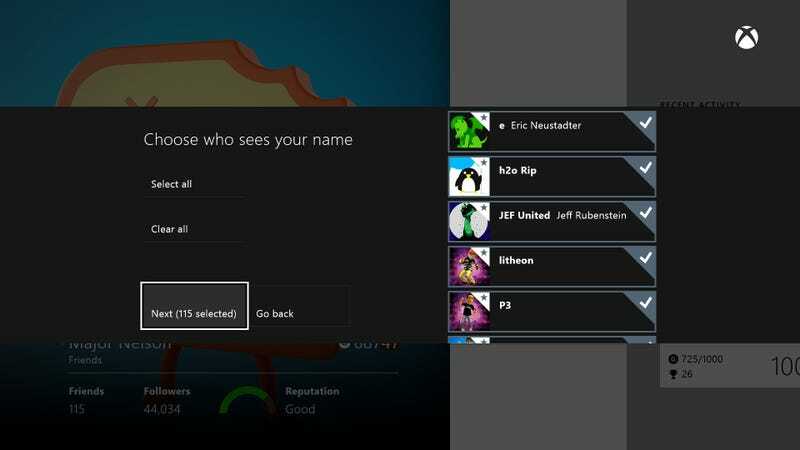 On Sony's console a user sends a specific person on their friends list a "real name request". The other person has to accept it, at which point, both users appear to each other, on the system level, with their real names. The PSN gaming names don't appear at the system level anymore, though those real names don't appear in games. There is no way to do bulk real-name changes a la Microsoft's new plan. Microsoft did not say exactly when in June the new update will hit, but they did indicate that it will be timed to hit shortly before the recently-announced plan to remove the Xbox Live Gold requirement for video streaming apps.